According to the Radicati Group, by the end of 2016, the total number of worldwide email accounts is expected to increase by over 4.3 billion. In addition, studies have shown that for every $1 spent, email marketing generates $38 in ROI. Yet, why are some customers and prospects groaning in frustration every time your email hits their inbox? Probably because customers are overwhelmed with information today. Another email can mean another annoyance. 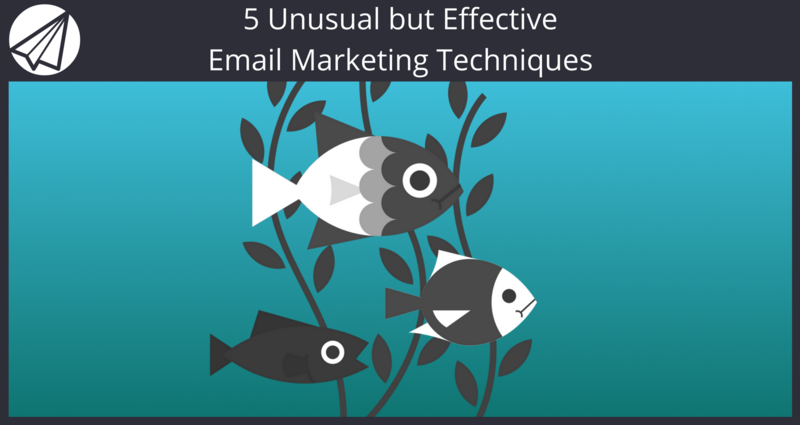 If you’re still utilizing old school email marketing tactics, you need to STOP right now. True, there is a fine line between helping customers and coming across as spammy. Plus, you can’t please everyone–there will always be that person who clicks on the unsubscribe button. Still, email marketing is not dead—nor, is it going anywhere. When McKinsey states that the average order value of an email is three times that of social media–you know you have to keep up with your email marketing strategy. Here are five unusual email marketing techniques to keep your client and your lead list growing. A bit of history–In October of 1971, the first email was sent. Your customers want you to be their subject matter expert. They just don’t have time to engage in comprehensive research if it doesn’t affect their bottom line. So, when it comes to email marketing–you must stand out from every other email they receive. Why not send an email that actually celebrates the email? You might write a bit of history on this form of communication while recognizing the milestone. Another suggestion is to ask your customers to refer-a-friend through email. Electronic messaging has transformed global communication. Your customers and prospects are certainly aware of that fact. Engage them by asking them to participate. Contemporary marketing needs to get personal. You can’t just blast off several hundred or thousands of emails and hope you get a bunch of clicks. You might not be able to make a connection with everyone on your email list, yet, you still want to get closer with targeted email. How do get the ball rolling? For starters, you must have the right insights to help you understand your buyer personas and the sales funnel process. Furthermore, not every email should be intended to make a sale. I know, you had to read that again. Still, it is true–part of email marketing is building trust. As a result, and I’ll write it again, not every email should have the goal of making a sale. Why? Well, when your customers and prospects trust you, they are more inclined to purchase from you. Just think of your own purchasing decisions. If you were to buy a new laptop–would you go with an unknown brand or one you trust? You want to start by identifying pain points. After that, it is all about offering solutions. This can correspond directly towards super-targeted email messages. With behavior intelligence technologies, you can understand what patterns and messages will grab a larger segment of your target audience. According to Experian, personalized emails deliver 6x higher transaction rates. With a database of information and market research collected, you can start to design your segmented email marketing campaigns. This is unusual in essence since old-fashioned techniques were basically a one-size-fits-all, click-and-send type of strategy. Not anymore. Now, you can access predictive analytics to help you predict customer response to your targeted email campaigns. What? Hashtags in emails? Yup, you better believe that hashtags will help to increase your open rate. By now, most Internet users are familiar with the hashtag. It’s used everywhere! Teenagers use them frequently, but so do marketers. You’re probably thinking, this is too much work. Yet, it really isn’t. You can craft one course per week. On the other hand, work on the entire course, then, send them out once a week. Through education, you can establish a strong connection with your customers. It all circles back to answering questions and solving problems. If you want to become a leader in your industry, you need to prove that you understand it. Plus, it helps with building your email subscription list by providing beneficial information and enhancing trust. Regardless of your industry, there is certainly something you can teach and share. The reason for staggering emails is to allow your customers time to digest the information. You can use Sendlane™’s autoresponder or workflow feature to schedule the emails with enough time for your subscribers to digest all of your great information. Then, it becomes akin to a chapter in a book–no, it does not have to be 50 pages. If you work in the luggage industry, you might offer an email course on packing techniques or underrated destinations. As your subscribers absorb your helpful information, they start to look forward to the next piece of your course. To take your email marketing campaign strategy to new heights, try one or all of the above suggestions. You are going to need a great email software to be sure all of your emails are delivered and get customer engagement. The best way to do that is to sign up today for a completely free 14-day trial of Sendlane. We hope you found this helpful and would love to hear what techniques work best for you to get engagement with your email subscribers. Please let us know in the comments below!